Four score and seven bowls ago — Blazin’ Abe is as classic as it gets. 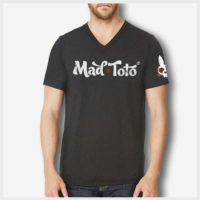 This is a Mad Toto Vintage black lightweight t-shirt with an old school Blazin Abe design. This unisex essential tee fits like a well-loved favorite, featuring a crew neck & short sleeves, designed with superior combed and ring-spun cotton with shoulder taping. The amazing Team Toto screen prints all our shirts by hand and in house.